Jon Esparza over at Jon’s Crazy Stuff put out a call for cartoons falling into several categories. I of course chose Frosty coming to life in my own twisted way. That dog was always around in the Frosty special and you can bet he relieved himself at some point in the snow. Why not right before he was built. Follow Jon at JonsCrazyTweets and check out all the other cartoon entries at Jon’s Crazy Stuff. Must be the royal wee! The puppy looks so happy though! Maybe it’s a magic dog, and that’s what made Frosty come to life. Well the dog doesn’t mind one bit. Everyone else, a lot. Too funny. Snow with some color in it. Good thing your cartoons are not just black and white. They were in the beginning! Now thats a pissed off snowman. I like the cartoons! Glad to have come across your page after Tony pointed me in the right direction! haha…that’s another way to think about it. He was made of snow, but the children know to stay far away! 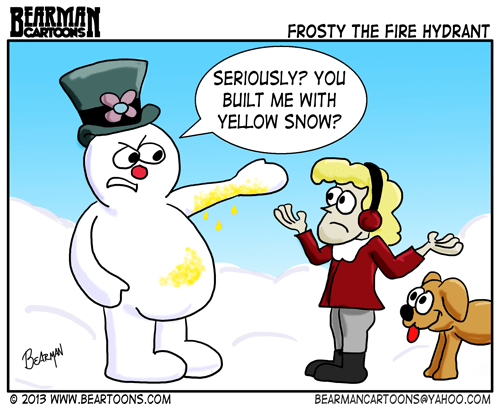 Now we know what Frosty is really made of! I love Frosty in any color. Geesh, I heard yellow was ‘in’ this time of year. Figured he’d like it. Wow that is hight praise. Make sure you say what I wrote with the voice of the comic book guy from the Simpsons. Maybe it really is lemon this time?